Assistant Clinical Professor in Family Medicine. Dr. Yelba Castellon-Lopez attended the David Geffen School of Medicine at UCLA for her medical degree where she was part of the Charles R. Drew-UCLA Medical Education Program. Dr. Castellon-Lopez completed her post-doctoral clinical training in Family Medicine at the UCLA Family Medicine Residency Program. Throughout her career, Dr. Castellon-Lopez career interests have include addressing health disparities and improving the health of vulnerable communities in South Los Angeles. Dr. Castellon-Lopez joined the faculty in 2017 after completing a post-doctoral research fellowship in the Robert Wood Johnson Clinical Scholars Program at UCLA. During her time as a clinical scholar, Dr. Castellon-Lopez obtained a Master’s of Science in Health Policy and Management from the UCLA Fielding School of Public Health. Dr. Castellon-Lopez was born in Nicaragua and immigrated to South Los Angeles where she grew up with her family. Her experiences growing in South Los Angeles have been her motivation to give back to her community and use research and policy as vehicles to improve the health of vulnerable populations. Dr. Castellon-Lopez is currently conducting a study in partnership with a Los Angeles DHS safety-net clinic utilizing a pharmacist-delivered shared decision making module to engage low income Latino patients in evidence-based diabetes prevention strategies. Dr. Castellon-Lopez's research interests include community based participatory research, the disease trajectory of diabetes, immigrant Latino health, workforce diversity, and health disparities. 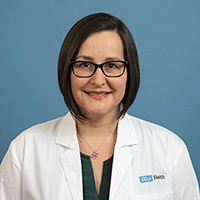 Dr. Castellon-Lopez sees patients at the UCLA Family Health Center and Venice Family Clinic where she also trains family medicine residents and medical students.